Choice Of Dressings: Vinaigrette, Ranch, Blue Cheese, Sesame, Lemon Pepper. mixed salad greens, chopped chicken breast, strawberries, toasted almonds with sesame dressing. baked wild salmon served on mixed greens, tomato, cucumber and lemon pepper dressing. tuna salad on a bed of mixed greens, with tomatoes and cucumbers. mixed greens, grapes, dried cranberries, toasted almonds blue cheese with house balsamic vinaigrette. soup with half sandwich a choice of turkey, ham or tuna. Choice Of Bread: Wheat, Baguette. grilled chicken breast, lettuce, tomato, roasted pepper, hummus spread on pita bread. turkey, swiss cheese, lettuce, avocado, tomato with dijon mustard, mayo. ham, brie cheese, lettuce, fresh gala apples with dijon mustard. grilled chicken, tomato, avocado, lettuce and swiss cheese with cream cheese spread in a flour tortilla. turkey, swiss cheese with pesto spread on baguette bread. mozzarella cheese, fresh basil leaves, tomato, pesto spread on baguette bread. roasted pepper, roasted eggplant, lettuce, tomato, hummus spread wrapped in a flour tortilla. roast beef, mayo, lettuce, tomato. mesquite chicken breast, mayo, lettuce, tomato. served with tortilla chips and salsa. roasted chicken breast and mild mexican cheese served in a flour tortilla. baked wild salmon and mild mexican cheese, tomato, avocado, served in a flour tortilla. mild mexican cheese served in a flour tortilla. chicken or salmon, lettuce, tomato, mexican cheese, served on corn tortilla with our house salsa and chips. beans in meat sauce served with mexican cheese, tortilla chips and salsa. We ate outside surrounded by sculptures - very lovely setting with both sun and shade spots available. The food was soup, sandwiches, and salads - all great. Wonderful ambience! 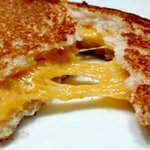 Good food choices - the soup and sandwich was a tasty choice. Very friendly service. The inside space is dark but the outdoor space is exceptional with sculpture water features and shade! A very ordinary assortment of cafe snacks. We somehow thought it might be more interesting given the location under the excellent Palm Springs Art Museum... it feels like so much more might be possible. 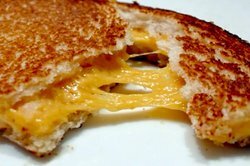 The Delectably Gooey, Grilled Cheese is Off the Charts Good!! Nice little cafe in the Palm Springs Art Museum. Plenty of seating and good food. 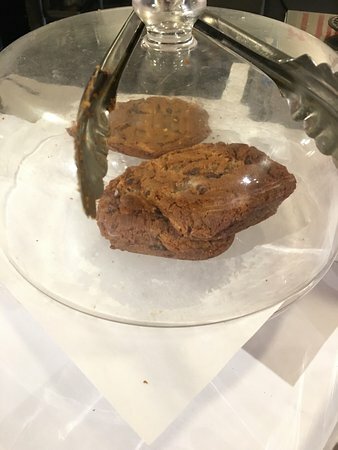 We can recommend any of the Panini sandwiches on the menu followed by their big cookies. 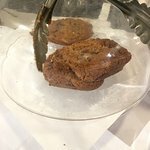 Very delicious food and friendly service. 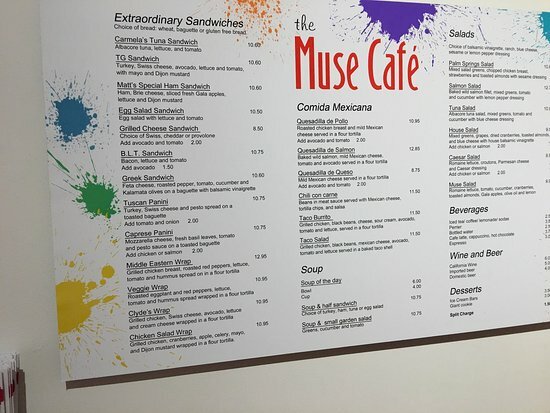 The Muse Cafe in the Palm Springs Art Museum offers typical Museum food and drink. If possible, I would recommend eating at nearby restaurants. However, a good cold drink when it is really hot outside is appreciated. We had lunch on the patio here after visiting the museum. The food. Was very good and not overpriced. 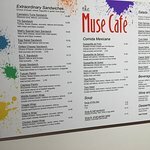 Get quick answers from The Muse Cafe staff and past visitors.